A melange of vocalists from across the nation, the Backstreet Boys have taken America and the world by storm since their debut album Backstreet Boys was released in early 1996. Jive Records, who also record with Britney Spears and ‘N Sync, signed Nick, Howie, Kevin, Brian and A.J. in 1994. The band had already spent time polishing their act with former New Kids on the Block managers, Donna and Johnny Wright. The first release turned them into sensations almost overnight in the European market. The cd was released one-year later in the European market. The cd was released one year later in the States amidst the Hanson and Spice Girls boom. The band broke easily into the market. “Quit Playing Gaymes (With My Heart)” strengthened the album’s No.29 debut on the charts. 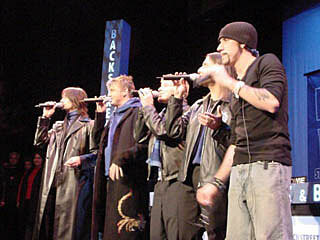 Backstreet Boys has received gold and platinum sales in more than 45 countries. The release of Millennium pushed the band even higher into the charts. It entered the Billboard Top 200 Album chart at No.1. Selling over 1.1 million albums in its first week alone and shattering the previous Soundscan record, for most albums sold in one week, that had been held by Garth Brooks. Millennium has held the No.1 spot worldwide, including that in Canada, India, Korea, Mexico, Portugal, Spain and Taiwan. The album reached five time platinum sales in the United States. Millennium features songs co-written by the Backstreet Boys, with tracks produced by Mutt Lange (Shania Twain, Bryan Adams). The band gained much deserved credibility with the release of , even Elton John gave his support. Black and Blue the groups next release is due on store shelves on November 21. Sales of the album are expected to exceed those of their earlier releases.